The Iraq War was a protracted armed conflict that began with the 2003 invasion of Iraq by a United States-led coalition, which toppled the government of Saddam Hussein. The conflict continued for much of the next decade as an insurgency emerged to oppose the occupying forces and the post-invasion Iraqi government. An estimated 151,000 to 600,000 or more Iraqis were killed in the first 3–4 years of conflict. The United States officially withdrew from the country in 2011 but left private security contractors in its place to continue the war. It again became re-involved in 2014 at the head of a new coalition; the insurgency and many dimensions of the civil armed conflict continue. 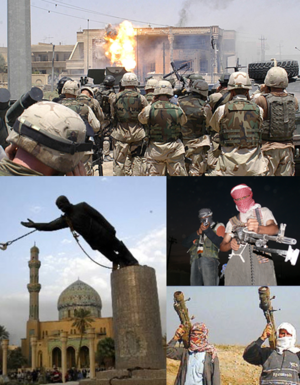 Clockwise from top: U.S. troops at Uday and Qusay Hussein's hideout; insurgents in northern Iraq; an Iraqi insurgent firing a MANPADS; the toppling of the Saddam Hussein statue in Firdos Square.